In the immediate aftermath of the high school shooting in Littleton, Colorado, there was a lot of talk about the violent images kids see on TV and in the movies and games, and how these images create or enhance violent tendencies. I don't think there's any doubt that kids' minds are like sponges, soaking up what they're exposed to. Or perhaps that old saying about computers is appropriate: GIGO: garbage in, garbage out. What I'd love to see is this: kids exposed to less killing, and more kitsch. Kitsch isn't dangerous, it doesn't teach bad words. And you never know where it will lead. Case in point: Many, many years ago a little boy was taken to Margate, New Jersey, then known as "South Atlantic City." There, a real estate developer had spent an enormous amount of time and money building something he thought would attract attention to the area. By the time he was done with his project, it had consumed over a million pieces of wood and 12,000 square feet of sheet metal, weighed over 90 tons and stood 6 stories tall. It was a building shaped like an elephant, and it was named Lucy. After visiting Lucy, the little boy, Claude K. Bell, embarked on to a happy lifelong journey of constructing enormous sculptures. He started his career making figures of gold miners and a minuteman at Knott's Berry Farm in Buena Park, California. Later, he bought 76 acres of desert to create his masterpieces. Bell spent more than two decades of his life and $300,000 in creating big friends for you and me: a 150-ton, 150-foot-long concrete "brontosaurus" named "Dinney" and a 65-foot-tall, 100-ton T. rex named, well, "Rex." Postcards (our fotos didn't come out): Western Resort Publ. & Novelties, Palm Springs, Ca. ; Fortune Group, Washington, Ut. Inside the "brontosaurus" [and, yes, I know that the term "brontosaurus" is a fallacy, as the original brontosaurus specimen was an apatosaurus accidentally assemblaged with a camarasaurus head] is a nifty walk-in gift-shop/natural history museum (it's more shop than museum). Inside the shop is a glass case, and inside the case is a yellowed newspaper clipping of Lucy. Claude Bell, sadly, died in September, 1988, at the age of 91. He had dreamed of a giant woolly mammoth and saber-tooth tiger to join his dinos. Too bad his dream won't be fulfilled, at least not by him. Violence begets violence. Kitsch begets kitsch. Take your kids to see Claude Bell's dinos. Who knows what they'll be building afterwards. For more information on Lucy, click here or here. The design for Lucy was also patented. For visiting info, call 609-823-6473. 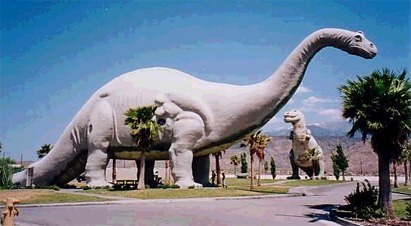 Claude Bell's dinosaurs are on Interstate 10 at the Cabazon exit, about 18 miles west of Palm Springs, California. They're right on the way between L.A. and Joshua Tree National Park. You can't miss them. I hear you can take helicopter rides on weekends (around $10). Access to the dinos is unrestricted, and the gift shop is open all year round. LOCAL RESTAURANTS: There's a Denny's and a Burger King on site, if you like Denny's or Burger King. I am told that: "The Denny's has many window views of Dinney and Rex for the children to enjoy along with balloons for all the kids." Alternately, there's the Wheel Inn Restaurant, where I hear they have Peanut Butter Cream Pie. I am also told that there are currently (2/00) plans in the works for building a full service truck stop along with a hotel as soon as a flood wall can be built. For another big concrete dinosaur, check out Dixie. My wife and I really liked the Kitsch tour. These are definitely the places we want to see when we visit America one day. I particularly liked the dinosaurs as they are a lifelong passion of mine. There is a full size paper mache tyrannosaurus in Birmingham Museum and Art Gallery. it looks huge when you are four but not as big as the ones we saw in your tour. This was one of the things that made me become a sculptor, which proves your point. take your kids to see kitsch and who knows what they will build. regards Bill and Claire Voyce. England. 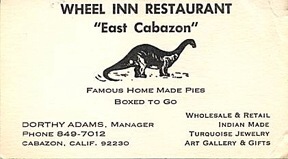 I am not sure why, but I did a search on "Wheel Inn Cabazon" in a fit of nostalgia, and I found many more pages than I thought I would. Yours was one of them. My grandma used to work at the Wheel Inn, years ago. (So did my mom and my aunt.) She started out waitressing and eventually worked as a manager. Sadly, she died relatively young, a year before Claude Bell did. But I have many happy memories of eating pie at the Wheel Inn, whenever we visited my grandparents in Banning, up the road from Cabazon. I just wanted to thank you for assisting me in my trip down memory lane, and let you know I like your website! Thanks for information on Cabazon Dinos. 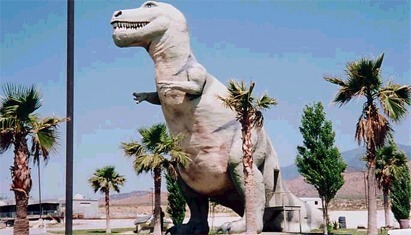 I saw Lucy in Margate a number of years ago, but never linked the "inspiration" for the dinos in Cabazon to it. When I was a child, my parents would wiz by the dinos on the way to Palm Springs, but they never took the time to stop to see them up close or inside. When I was dating my husband, he did take the time and now we have been married for eleven years. The dinos had a little to do with this. For whatever it is worth, yes, a little kitsch never really hurts anyone, sometimes it helps. As for postable comments on Claude Bell's two masterpieces, I can reasonable reassure all dinosaur buffs that at the time the two dinos were constructed, accurate and proper reconstructions of dinosaurs, even the two species as popular as apatosaurus and Tyrannosaurus-type Coelurosaur therapods were unavailable and non-existant. All he had to work with were the old "Marsh / Owen" versions of the big "Lizards" as tail draggers. I've been a Wheel Inn customer between Laguna Beach and Palm Springs, and between Los Angeles and Phoenix since I was seven years of age circa 1970. The two big dinos were not built at the same time. For many years it was just the Apatosaur "Dinny" at least by my recollections. There is something about Cabazon that makes you need to stop for a leak. My commitment to forensic style dinosaurs is absolute. You should see my properly redesigned "Godzillas!" --I have the Allosaurid genus version and the Ceratosaurid genus version. I took the time to page through your primary web site prior to responding. It looks like us two commercial illustrators just crossed paths by accident and providence. Looks like it was meant to be. You do really good work and your KITSCH TOUR is a very pleasant diversion from work. magazine production teams and book editors / publishers. [Bill designed two model kits for Testor. Here he elucidates.] The 1995 - '99 Testor deal was for two kits: The polystyrene plastic kit of the unblemished interplanetary skiff ("Roswell UFO") as described by the surviving atom bomb security agents of the United States Army Counter-Intelligence Corps--Cross referenced to the death-bed testimonies of Kelly Johnson and Ben Rich of "Skunk Works--And also resin kit of the "Crash Site." I am actually a forensic reconstruction illustrator who also writes sci-fi and vett edits for current authors in the bookstore such as Steve Alten ("Meg, The Trench, Domain, Goliath, and "Resurrection"). I illustrate their books, edit their manuscripts for scientific and historical accuracy, and basically get paid to help them not "Step on their cranks" literarily. I write my own short stories telling a massive multi-generational story in the Larry Niven way of story-telling. I'm a semi-retired undercover PI, ex-"Spook," and former Marine Corps veteran. I used to work with the old LAPD South Bureau Homicide team in the southwest central Crenshaw District "Warzone." Like you, I have multiple art gallery pages at our AlienUFOart.com web site. the following forwarded e-mail will include click links to specific highlighted pages you might enjoy. Thanks again, Your new "Bud!" I have been a resident of Cabazon for 13 years and was a waitress at the Wheel Inn for 7 years. Great peanut butter pie!!!! Our elementary school mascot is the Dinosaur. My son still loves to go visit the big creatures and so do I. Mr. Belle did a wonderful job and whenever someone asks, where's Cabazon? ?, we reply with, you know the big dinosaurs off the 10 fwy and then everyone knows where I'm talking about.